Birth of the band was on the occasion of a local event, the so called “Jazz-Art” at the Towntheatre Wels wich was first time 1998 dedicated to musicians living in and around Wels, but found its disease and early death on a lack of financial support and organisational weakness. Musician and singer Gerhard Klingovsky put together his own contribution too with a quartet – different in line-up for some reasons of term-collision, but already with an eye on the present members of this multisided ensemble, who´s musicians each are also involved in their own projects and are always gladly invited as guest at various live- and studio-sessions. 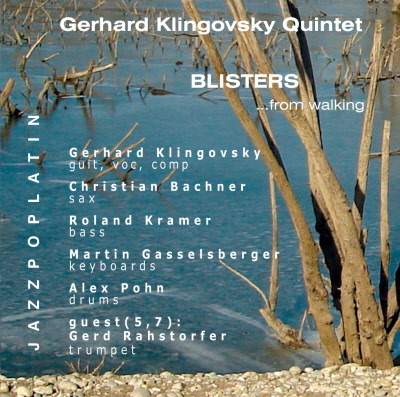 „BLISTERS ...from walking“ was first planned as and still is promotion-material due to get some live-gigs, but through technical conditioned delays (computer too small, new computer again crashed, permanent shortage of time,….) and renewed motivation while the shaping work adapting the raw material wich was banned to tape within half a day, it grew out a complete studio-production released on this CD. The individual tunes may have quite different character (jazz-waltz, pop-ballad, latingroove, modern jazz), but through the interpretation of these particular musicians and their solos comes a peculiar collective colour, that creates the whole thing to a quite representative album. The cover fotos show cuts of sunken trees, engulfed by the ice of the water-reservoir at a park near Wels, referring to the melancholic words of the title-song “Blisters”, that tells from overcoming difficult times, the bliss of a moment and the odd of failing in spite of fulfilment. Branches of longing, perhaps a bit resignation or solitude towering out of a sky in imaginary blue and turquoise – grasped tightly by the ice for a short while, to be inevitable released by the slowly warming up enviroment and brightening ether.